Travel to Ireland with Celtic Tours World Vacations! Choose from our large selection of Ireland escorted tours, Ireland self-drive vacations, Ireland small group tours, Ireland independent trips, Ireland B&B packages, Ireland Golf Vacations, and Ireland chauffeur drives. Our Ireland tours are perfect for people of any age, from children to seniors. If you don't see something here that works for you, give us a call at 1-800-833-4373 and we can customize your Ireland vacation for you. Travel throughout some of Ireland's most scenic locations, on this 6 night escorted tour. Begin your journey in Dublin and travel west to the charming city of Galway, one of the most unique areas of Ireland to explore. We will discover the barren fields, rugged coastline, and scenic beauty that makes Galway to the Cliffs of Moher, Killarney and taking in the spectacular Dingle Peninsula! Spending your last two nights at Fitzpatrick's Castle Hotel! Join us and celebrate St. Patrick's Day in Ireland! Celebrate St. Patrick's day the Irish way, on this fun-filled, 6-night escorted tour. BEST FULL CIRCLE TOUR OF IRELAND! BOOK EARLY FOR EARLY BIRD SAVINGS! Enjoy the best of Ireland with a relaxed and inclusive Irish Rose itinerary for 2019. Your itinerary includes 2-nights at a deluxe castle and historic sights, scenic routes including the awe-inspiring Slieve League Cliffs in Donegal, the Antrim Coast; location of many scenes from the popular Game of Thrones® and the spectacular Giants Causeway. Also enjoy breathtaking views along the Ring of Kerry and the majestic 700 foot high Cliffs of Moher. This tour offers early bird savings! Our Celtic Sojourn brings you six fantastic nights, exceptional touring and a 2-night Castle stay. This upgraded tour brings you the best of Ireland. For those with limited time who want to enjoy a relaxed tour that includes notable attractions, the Celtic Sojourn is for you. From Belfast to Donegal you will see awe-inspiring cliffs, historic museums, and enjoy excellent food while experiencing the beauty of Ireland. This tour allows you to explore some of Ireland's top attractions. Take a scenic tour of the Dingle Peninsula, explore the history of Ireland's oldest city; Waterford, and visit some of Ireland's most popular areas on this 6-night escorted tour. 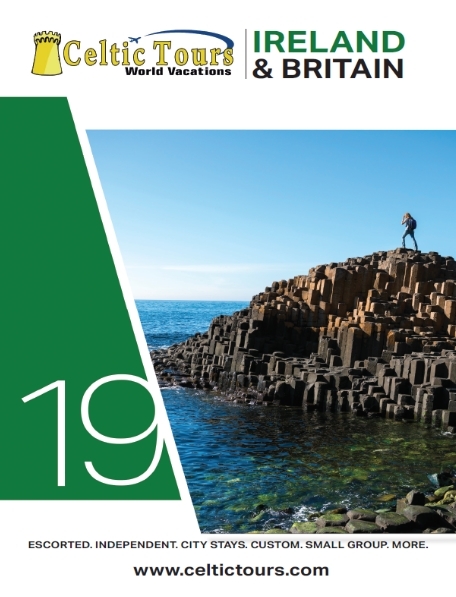 A new two day tour, taking in the Giant's Causeway on Day 1 with 4 star Belfast hotel accommodation and on Day 2 a relaxing day of exploring Belfast and its attractions including The Titanic Quarter. Experience one of Ireland’s most famous cultural and historical nights – The World Famous Medieval Banquet in the Great Hall of Bunratty Castle overnighting in quality hotel accommodation in Bunratty Village and enjoying a tour to the Cliffs of Moher and Galway Bay – the next day. Time to explore Galway City on Day 1. An overnight tour to the glorious West of Ireland including a comfortable overnight located in the City Centre of Galway also known as the City of the Tribes, you will have the evening free to experience this most exciting city full of really good pubs and restaurants, many with traditional Irish music - hear the Irish language - Gaelic being spoken. The next morning after a full Irish breakfast you will be taken on a great tour of one of Ireland's most scenic regions, Connemara. An overnight tour to the World famous Killarney situated on its famous lakes and under the highest mountains in Ireland the Macgillicuddy Reeks. Your tour includes four star standard Hotel accommodation in Killarney town centre with its large selection of cozy pubs and restaurants for you to explore and enjoy. We include full Irish breakfast and a tour of the stunning Ring of Kerry, along the Wild Atlantic Way. The Ring of Kerry is a 179-km-long circular tourist route in County Kerry, South Western Ireland. On this tour there are views of the Skellig Rocks (islands), where Star Wars 'The Force Awakens' was recently filmed. An overnight tour to Ireland's mid western capital Limerick , the Treaty City , on the banks of the majestic river Shannon. This tour includes four star standard Hotel accommodation in the City Centre and a full Irish Breakfast. Your evening in Limerick is free to explore the locations where the film Angela's Ashes was made and perhaps have a pint in one of the city's many Traditional pubs. The next day we will take you to visit Medieval Bunratty Castle then on to a charming pub for a lunch stop on the remote Atlantic coastal village and then to the Cliffs of Moher. We travel through the Burren, around Black Head and on to Galway City along the shores of Galway Bay. This tour covers a large part of the Wild Atlantic Way. We head South to visit Cork, Blarney Castle & the Ring of Kerry, West to the Cliffs of Moher, Connemara, the Aran Islands in Galway Bay. Independently discover the awe-inspiring coast of Ireland, on the Coastal Discovery, 8-Night Self-Drive tour. Venture into Wicklow and visit the Powerscourt Gardens, or travel amongst the Wicklow Mountains into Glendalough. Follow our suggested itinerary to see spectacular views, lively streets, and beautiful countryside. IRELAND YOUR WAY - with SUPER SALE SAVINGS! Open B&B Vouchers and Car Rental - tour your way at your pace! IRELAND YOUR WAY PREBOOKED - with SUPER SALE SAVINGS! Pre-booked B&B Vouchers and Car Rental - tour your way at your pace! LET US BOOK YOUR NIGHTS FOR YOU! It just keeps getting better! Enjoy five (5) nights in Ireland PRE-BOOKED in the locations of your choice! With pre-booked vouchers - you will advise Celtic Tours what locations you would like booked, and we will select the B&B's accordingly. Explore Ireland - off the beaten track! A new self-drive experience! 7-Nights independent package - exploring Ireland! A fantastic new self-drive Ireland adventure that takes you off the beaten track and allows you to explore some of the most breathtaking beauty found in Ireland. Let the road take you on a true Irish adventure, where the places and people all come together to bring you the best of Ireland! Embark on your adventure independently, with this carefully curated self-drive package, offering a variety of confirmed B&B, hotel, and castle stays. Discover the majestic sights of Ireland at your own pace, allowing you the flexibility to choose the places that you want to explore. 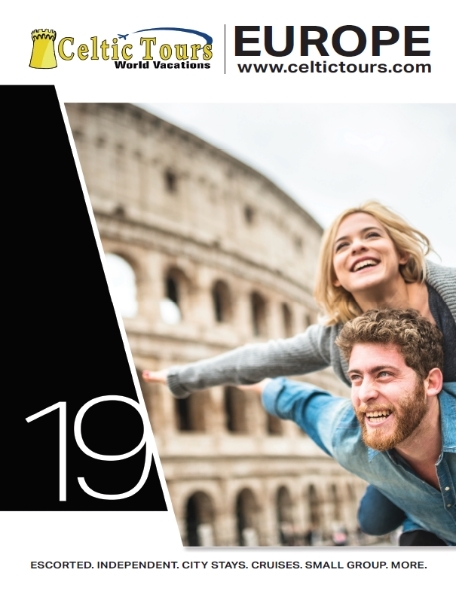 Follow our suggested itinerary for a mixture of scenery, adventure, and culture, but remember - you choose what you want to do, making it your personalized "Great Escape". 7-Nights Original Irish Hotels + Car Rental. Experience True Irish Hospitality! Welcome! Original Irish Hotels is a unique collection of family owned and run hotels in Ireland. These beautiful hotels are among the most friendly hotels throughout Ireland, offering traditional Irish Bed and Breakfast hospitality. We have selected some of our favorite Irish Country properties and packaged them with special pricing just for you! Stay with Original Irish Hotels for your holiday in Ireland for a truly warm Irish experience, meeting the locals in the hotel bar, enjoying locally produced Irish cuisine or taking in the fabulous scenery on the doorstep of these wonderful family owned hotels. Idyllic Ireland awaits. Castles and Bed and Breakfasts are at the heart of every traveler to Ireland. Whether you are looking for a romantic escape or the true Irish experience, our Castles and cottages self-drive vacation is the perfect choice. Meander through the back roads of Ireland, while staying in luxury castle hotels and idyllic B&B of your choice. Game of Thrones® Inspired Vacation! The adventure continues! Step into the scenic splendor of the seven kingdoms and see where many of the pivotal Game of Thrones® scenes were shot. This self-paced Ireland vacation brings to life the drama of the series, but also provides a journey into local myth and legend. Vacations built to suit...please call 1-800-833-4373 and ask for a group specialist to help with your needs! Golf Vacations built to suit...call the Celtic Tours golf expert to plan your perfect golf get-a-way at 1-800-833-4373.